Evil Dead (2013): Gore, Gunge And A Goddamn Good Time. I don’t usually like remakes. They seem unnecessary; a high budget re-hash of classic cinema for what seems like pure profit. I would much rather see a studio take a risk and do something totally new and different, without a hint of re-working, re-making or re-anything. Cult films that should remain as definitive works are being dragged up, and given a modern make over to be re-sold to a fresh audience; Total Recall and the shiny new Robocop, with his slim line suit for example… (ugh). I just think it’s not needed, I feel the same way about certain sequels too, when they unnecessarily make a mockery of the original product. 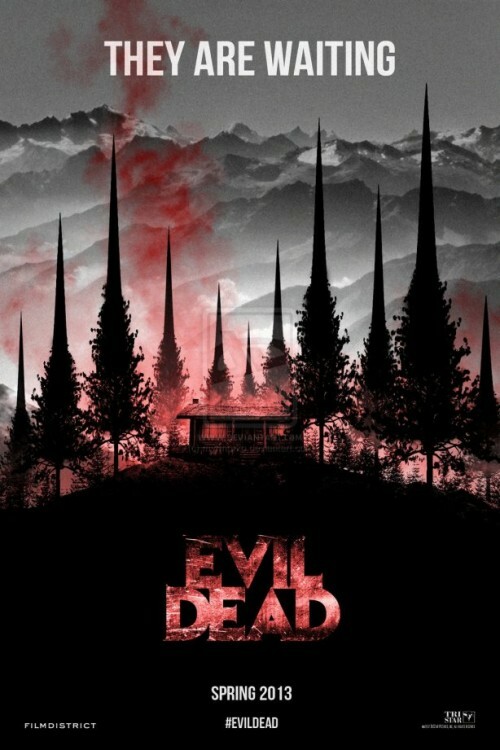 It’s exactly what I thought when I first heard they were rebooting Sam Rami’s 1981 video nasty; Evil Dead. I consider myself a big horror fan. I love that on edge, spine chilling feeling you get from a movie that actually mentally scars you for a while afterward; a film that downright disturbs you. The original Evil Dead was the first time I experienced a film that really haunted me for a period afterward. The later Evil Dead films had over the top humour and their own charms, but the first Evil Dead truly terrified me, and I was addicted. Its gore and sheer chaos, compels you to watch it to completion, then at the end just spits you out; leaving nothing but a disjointed mind and a lust for blood. The film’s amazing use of prosthetics for the early eighties, added a real feel for the piece, as well as the insanely odd plot taking the viewer on a real journey with, of course, the superb Bruce Campbell as the insane blood-soaked survivor, Ash. What needs re-making? Sam Rami and Bruce Campbell are back both as producers, with Rami’s chosen director Fede Alvarez at the wheel, telling anyone and everyone at how incredible, awesome and downright nasty this film is, and the more I’m hearing, the more I’m inclined to believe it could be good, even great! I mean would the Chin lie to us? With their modern creation now being centered on a group of twenty somethings who have a really really bad night, Evil Dead centralizes on a female lead, removing Ash, the central character which Campbell originally brought to life. It’s a wise move, as a comparison between the two movies becomes more difficult. It should reduce the onslaught of die- hard fans churning out “that’s not what Ash/Campbell would’ve done” etc. No-one could portray Ash like Campbell did, so personally I’m glad they aren’t going down that path. It also sets this movie up to become its own stand-alone beast, they’ve opted for the horror side, not the comedy angle, producing a new vision, being aptly titled a ‘re-imagining’ by Alvarez; using the terror and insanity of the original, but setting up its own horror footing in 2013. I love that it’s the return to the old school horror picture that us fans have been yearning for all these years and not quite getting. Dare I say this could be the modern, mainstream video nasty us horror nuts have been waiting for?! The thing that really impressed me, the one thing alone that should encourage any horror fan to see it, is that the film has no CGI whatsoever. I LOVE THIS. The red-band trailer alone makes that an extraordinary statement when we are treated to images of the tongue splitting, blood pouring, gore- FEST it promises to be. It’s one of the reasons pure horror fans love these ‘video nasties’; it is the visceral portrayal of real life guts and brains exploding out of people. Prosthetics in horror just LOOK better than CG and a lot of fans will appreciate the return to old school practical effects, kneeling in homage to the original Evil Dead. Oh and if you thought they’d leave out the infamous tree scene? Think again. I’m sure fans will be getting tickets April 12th, but the film is released April 5th (with select theatres having a 10pm screening April 4th).